It's that time of year to start shopping for family members and friends. If you know someone who has recently moved to a new house or perhaps hasn't even moved in yet, it may be a good idea to shop for housewarming gifts. There are so many good housewarming gifts that will brighten up any home. Today, I'm going to go over the best new home gift ideas to give to someone who has recently moved into a new house. These thoughtful gifts will surely brighten their day. Let's get started. This magnetic key holder is extremely useful, especially if the person you are gifting this to uses his or her keys a lot. It is magnetic, so all you have to do is set your keys on it and they stick to it. You can order it in any shape of the United States. This doesn't have to just be used for keys. You can also use it for tools and anything else that is metal. Each cherry wood state silhouette is easy to hang in a foyer or mudroom with either adhesive strips or screws. The strips and screws are included. This is the perfect gift for a new homeowner. Every home can use a good doormat outside. Doormats will help trap mud and dirt outside instead of in the house. There are so many adorable doormat options available. 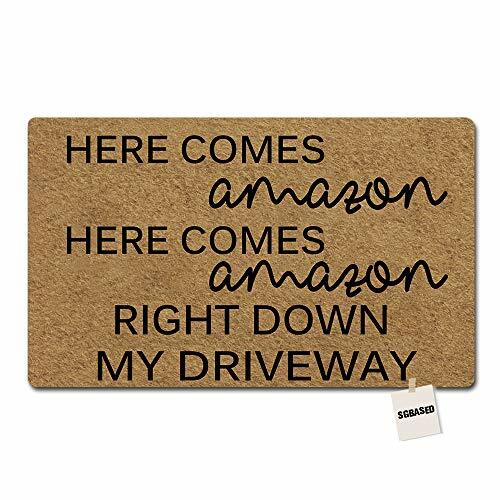 One adorable doormat says, "Here comes Amazon, Here comes Amazon, Right down my driveway". If you decide to get your friend this doormat for Christmas, it may be nice to pair it with an Amazon gift card. If your friend has dogs, cats, or any other pets, consider getting a doormat that says, "Wipe your paws". Your friend doesn't have to have pets in order to want this doormat, but pet-owners will think its even more hilarious. There isn't a better way to celebrate living in a new house than putting a new home Christmas ornament on the tree. This new home Christmas ornament has the words "Welcome Home" on it. 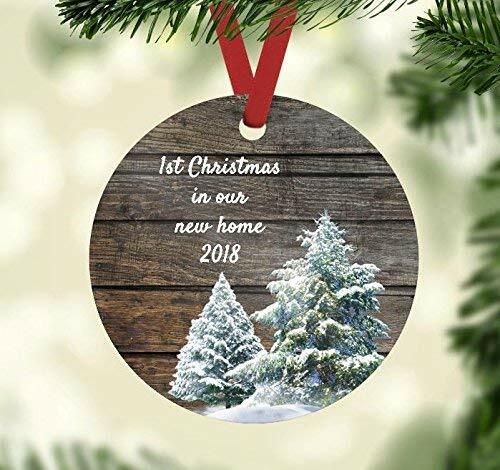 If you are looking for personalized housewarming gifts, consider purchasing a Christmas ornament that has that person's name on it and the date that they moved. Every home can use a new toaster. This toaster has a 7-setting shade dial. It has reheat, defrosts, and bagel controls. The toasting slots are 1-1/2-inch wide. This toaster features a slide-out crumb tray. It can be placed sideways or facing forward. 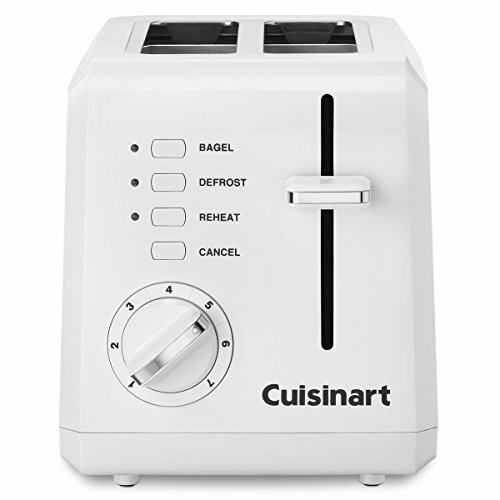 Whether making thick bagel halves or thinly sliced slices of bread, the wide slots and custom controls ensure even toasting. If you don't think your friend will want a new toaster, how about giving him or her new cookware. New pots and pans can always come in handy, especially after moving to a new place. Consider buying your friend this Betty Crocker cookware set. 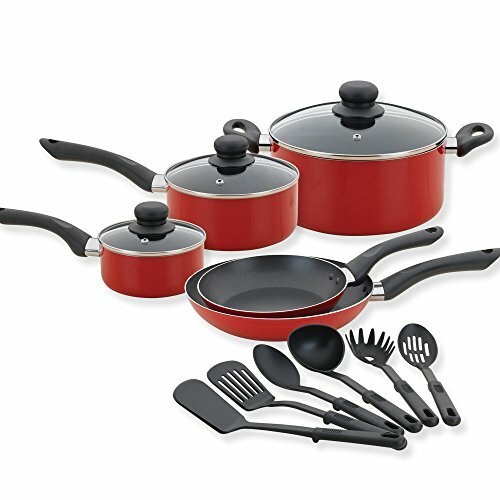 Included are one large fry pan, one small fry pan, two saucepans with lids, a large covered Dutch oven, a turner, a slotted spatula, a basting spoon, a ladle, a pasta scoop, and slotted spoon. These festive soap bottles make a perfect gift for anyone, whether they're new homeowners or not. The pump dispensers have cute holiday-themed images to add to your holiday decor. 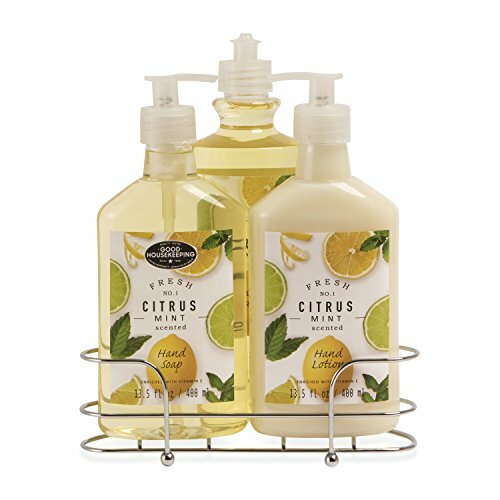 These soft, gentle hand soaps smell great and keep your hands clean and smooth. This set comes with many different scents, including Winter Snow, Gingerbread Cookie, Peppermint Swirl, and Vanilla Icing. 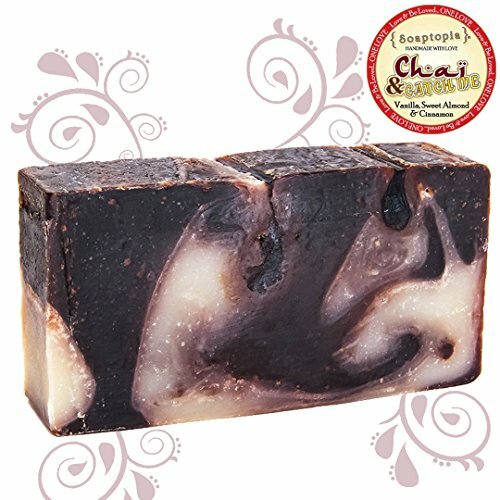 You may find that you will want to keep one of these soaps for yourself! This aromatherapy diffuser produces stronger mist than the old version. This means it will add more moisture and fragrance to the room. 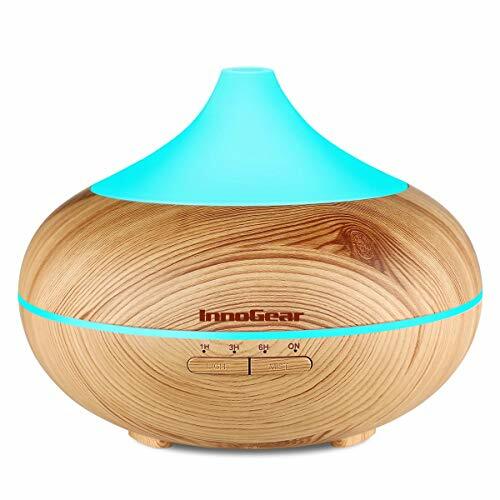 With a 500ml larger capacity, this essential oil diffuser covers spaces up to 269 square feet. The diffuser has ultrasonic technology and runs quietly. It will not be disruptive while you sleep. In addition to spreading the fragrance of essential oils, this diffuser has 7 color changing LED lights. The lights can be turned off, set to fade gradually, or can stay solid. If your friend loves essential oils, you can't go wrong with this gift. Of all the new home gift ideas, this one may be the most personalized. After all, how much more personalized can it get than having your name written on a cutting board? On the cutting board, you can write the date that your friend moved to his or her new house. 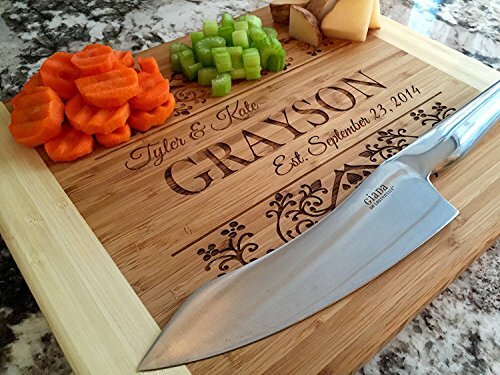 If your friend is married, you can write both of their names on the cutting board. This cutting board is perfect for any new homeowner. Although a lot of people look up recipes on the internet these days, cookbooks are still very useful. Perhaps there are no greater cookbooks than the ones put out by Betty Crocker. Betty Crocker's newest edition is the 12th edition. 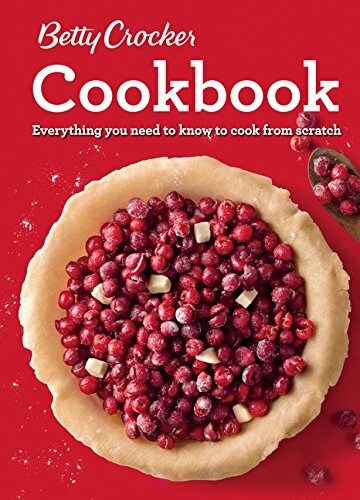 With 1,500 recipes and variations, and more than 1,000 photos, this colorful new edition is packed with recipes that are so easy to make. Just like many of the other Betty Crocker cookbooks, each recipe has very clear instructions and pictures that show how you should cook it. You can't go wrong with giving this cookbook to your friend. Without oven mitts and dish towels, handling pots and pans will be very difficult. That is why you should consider getting your friend this oven mitt set for Christmas. 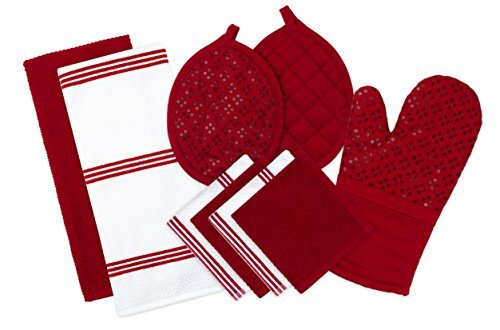 This collection includes two terry kitchen towels, four terry dishcloths, two pot holders, and one oven mitt. The printed silicone design on the oven mitt and potholders provide a secure non-slip grip while handling pots and pans. These towels and dishcloths are machine washable and can be dried in the dryer. For the oven mitts and pot holders, you can machine wash them and lay them flat to dry. A fruit basket allows you to store fruit in a stylish way. 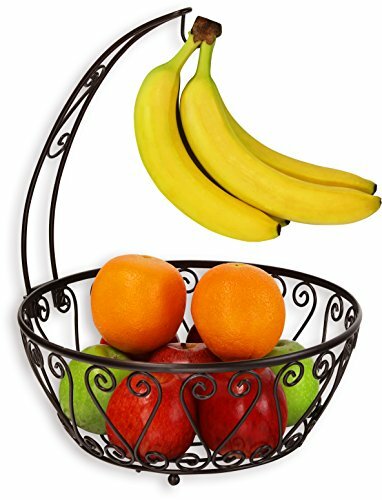 This fruit basket features a place to hang bananas in addition to the bowl below it. You can also hang grapes on the hanger. No more worrying about where to put fruit! Your friend will most likely find this gift to be useful in his or her new home. The bar of soap will make a perfect addition to your friend's guest bathroom. Scented with Vanilla, this soap bar is 100% junk free, all natural, and handmade in small batches to ensure every bar is made just right. Using natural ingredients like olives coconut, avocado, and shea butter, SOAPTOPIA crafts bar soaps with the perfect blend of soothing scents and a rich lather for a comfortable clean. This product can be used to clean the face, body, and hands. A throw blanket is always nice to have around. It can be used on couches, chairs, or beds. 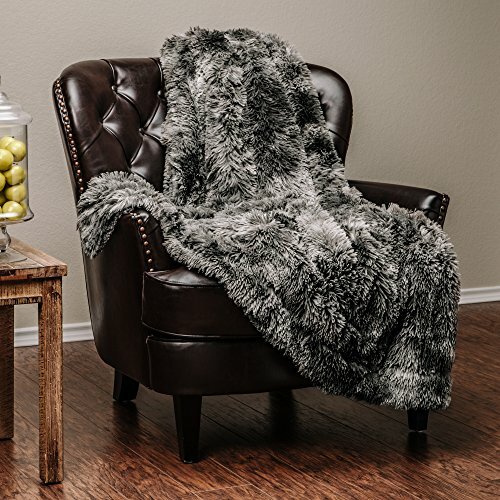 This high-quality faux fur throw blanket will not shed. The blanket size is 65"x50" inches, which means it is suitable for a couch, sofa, or toddler bed. This product is made from microfiber polyester. It can be machine washed on the gentle cycle with cold water, and it can be tumble dried at a very low temperature. This laundry basket measures approximately 17.7 by 13.8 inches to provide 43 liters of storage space. The thickened canvas fabric with leather handles provides a neatly tailored appearance and allow you to move the basket conveniently. 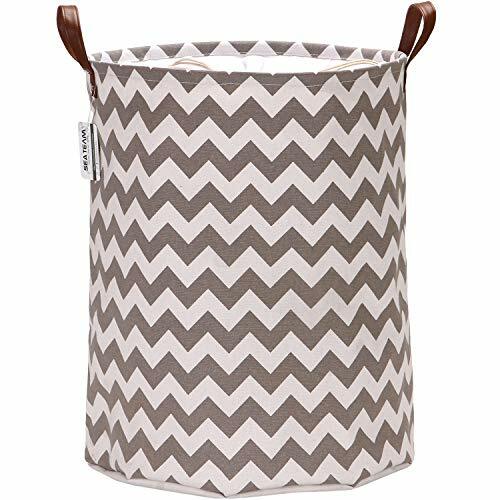 This laundry hamper is perfect for any new homeowner. Looking for some new home gift ideas? You have come to the right place. In this article, I went over the top best new home gift ideas that are perfect for new homeowners. From a Christmas ornament to cookware, these new home gift ideas will surely brighten your friend's day. Hopefully, this article has inspired you to start shopping for gifts for new homeowners. There are so many new home gift ideas available. Happy shopping!